Acclaimed as one of the sharpest political minds of his generation, David Laws saw his ministerial career nosedive before it had properly begun when, after only seventeen days as Chief Secretary to the Treasury, he was forced to resign over unintended breaches of the rules on parliamentary expenses. But you can’t keep a good man down, and Laws returned to government, where he was responsible for implementing the coalition agreement and planning the Lib Dems’ strategy in the run-up to the 2015 election. He began writing a diary in March 2012 and continued with it throughout his ministerial career, capturing his private reflections and immediate, detailed recollections of key events. Frank, acerbic, sometimes shocking and often funny, Coalition Diaries chronicles the historic Liberal Democrat–Conservative coalition government through the eyes of someone at the heart of the action. It offers extraordinary pen portraits of all the personalities involved, and candid insider insight into one of the most fascinating periods of recent British political history. 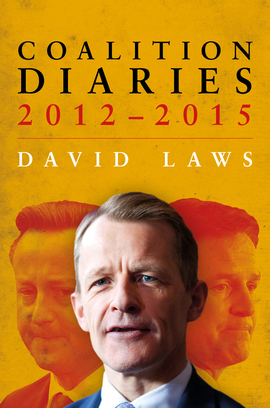 "David Laws had a rare vantage point on the Coalition government and provides a warts and all account. An excellent read."